Archaeological Survey of India and the Karnataka State Department of Archaeology and Museums have been conducting archaeological excavations at Hampi for the past many years and have discovered many interesting structures and antiquities of the Vijayanagara Empire, not known so far. The Vijayanagara empire of South India extended over a massive area and assimilated diverse ethnic, linguistic, socioeconomic and political groups. Beyond the majestic bounds, Vijayanagara was also part of multifaceted subcontinental political and cultural nexus, with cooperative and antagonistic relations with bordering states and empires. During such an excavation in 1984-85, officers of the Archaeological Survey of India laid bare a beautiful tank that was completely under the surface of the soil and was not at all visible from the outer surface. 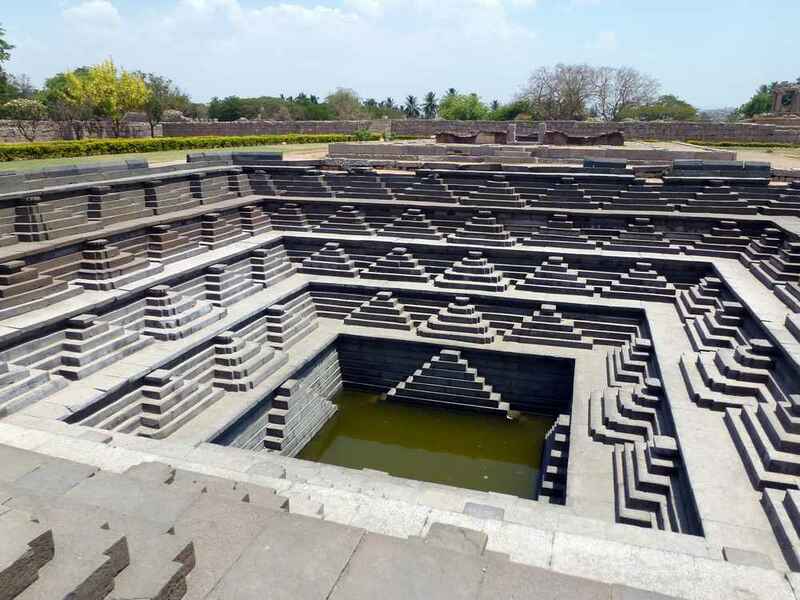 This is perhaps the most beautiful stepped tank at Hampi discovered so far. Archaeologists have been dated to fifteenth century AD. The tank built of stone is a square structure with five steps. The steps become smaller as they go down; thus the topmost step is the longest while the lower most is the smallest. From the top, the length of each side of the step is 20.7, 16.10, 12.65, 9.2 and 6.9 meters respectively. Each side has very attractive pyramidal shaped flight of steps to get into the next lower side. These steps are 9, 7, 5, 3 and 1 respectively in each side and thus the entire tank has one hundred steps. Each tier is 1.05 meters and the total depth is 6.65 meters. The base of the tank has stone slabs below that is sand to purify the water. The symmetry of the pyramidal shaped steps at each tier of the tank makes the structure unique and elegant. After the construction of this stepped tank, the engineers working at Hampi had made proper arrangements for the flow of fresh water into the tank. It is believed that this tank was used for religious purposes including the teppotsava of the deities. That the project of reclaiming cultural legacies as part of a regional or national inheritance was informed by a series of complex considerations of both affective pleasure and identity politics, wherein the idea of a reinvented tradition assumed a certain significance, is now well known. Another unique feature of this tank is the technique of its construction. Each stone used for the construction has numerals, symbols and Kannada letters on it. For example letters u, da, tu and pa represent north (uttara), south (dakshina), east (turpu), and west (paschima). In five stages there are 36 steps and each step has been assigned a Kannada letter beginning from tna upto jna and ti. In addition to these numerals and Kannada letters some symbols also have been used, according to the four directions. Another interesting feature is the mark of measurement through symbols. Thus the stepped tank (pushkarini) is not only beautiful and elegant but also supplies the technical methodology adopted by the architects to transplant it from the workshop to the spot of the tank.